← Is there life after neoliberalism? this analysis was the ABC’s Latika Bourke; I noted her propensity for ‘blocking’ Twitter followers. For the uninitiated, check out this link for an explanation of how Twitter works. Bourke has successfully become one of the most followed journalists in Australia on Twitter. People obviously appreciate that she contributes political news directly to her Twitter feed. Bourke is not employed to speak on ABC radio, to appear on ABC TV, or to write articles for ABC’s news website. Her full time job is to be a member of the Canberra press gallery – supposedly investigating news – and then reporting it to a captive audience on social media. Sounds like a great idea, doesn’t it! And a great job! There’s just one catch. And I’m not sure if Bourke has worked out what this catch is yet. The key words in Torney’s statement are ‘communicating with our audience’. Communicating. Twitter is not a broadcast media. It is a social media. The difference is, when you throw comments, opinion and news out on the Twitter feed, you are joining a conversation. A two-way conversation. I’m sure this two-way conversation is all fun and games when you check your @Connect stream and see lots of lovely comments like ‘Good work Latika’, or ‘you’re doing a great job’. But what about when you get feedback which isn’t positive? As of this moment, Bourke has 35,663 people following her @LatikaMBourke account and 7,123 following her @LatikaQT (question time) account. It’s very difficult to get to this number of followers without being ‘someone’. When I say ‘someone’, I mean a person who is in the public sphere, or by virtue of their profession, is given access to a public platform from which to be well known to the general public. A journalist is such a person. An ABC press gallery journalist even more so. To be paid to spend the day researching news, and then sharing this news on a social media platform is, I would have thought, a huge privilege. I would have thought that Bourke would take her role very seriously. Taking her role seriously would entail a certain respect for her audience, whose relationship with Bourke is based on the fact that she is employed by the ABC. While I have a personal Twitter account and I can use it to do and say whatever I like (within reason), it would seem to me that Bourke should always use hers to report news and interact with her audience as Latika Bourke, the ABC’s Social Media Reporter. This is how she is described on her Twitter profile, and this is what someone expects when they follow her account. We don’t follow her because we want to be her friend, or because she is witty and interesting, though she well may be that for all I know. We follow her because she is promoting herself as an ABC journalist. We follow her because she is paid by our public broadcaster to bring news to the ABC’s audience. This context is extremely important. So what does Latika Bourke do when someone responds to one of her Tweets with what she perceives as negative feedback? From what I can tell, she immediately blocks this Twitter user from viewing her Tweets or following her. To block someone on Twitter is quite an extreme reaction. It’s far more proactive than just ignoring someone – you physically have to go into the user’s account and select the ‘block’ button. Usually people block other Twitter users because they have been overly rude, offensive or even abusive. Blocking people in order to protect yourself from abuse is totally justifiable, and should be encouraged. I block for this same reason. I have no doubt that Bourke receives a lot of revolting abuse on Twitter due to the huge influence she has on this platform and I encourage her to block whenever she sees something that upsets or offends her. But my question for Bourke is – what exactly does upset and offend you? Because from the research I have done, Bourke is offended by anyone who doesn’t agree with her, and who chooses to tell her so through the two-way medium that is her tool of trade. I received a handful of responses from my followers saying that they have been blocked by Bourke, and that they couldn’t identify why they had been blocked as they were never abusive, offensive or rude. Keeping in mind the relatively small number of Twitter users who I can reach, a few responses represents quite a large number. No offending Tweets were identified. Again, I can vouch for the people who responded to me that they are not Troll-like, vicious or disgusting. Some of them said they thought they were blocked when they suggested to Bourke that she was biased towards the Liberal party. Any journalist, whatever their political ideology, will be called out for being biased if this is how they are perceived by their audience. The difference with social media is that the audience can now directly tell a journalist when they see bias. We can tell them if their facts are incorrect. We can tell them if we don’t like their work. If a journalist chooses to use a social media platform to reach their audience, they need to get used to feedback. Good, bad or indifferent. Journalists could even use this feedback to improve their work. You would hope that an ABC journalist would have a good reason to bar an audience member (a tax payer!) from seeing their news feed. A better reason than just not liking what they see. Even more strange was the Tweet that someone sent me while I was writing this post. This Tweeter reported that she went to look at Bourke’s feed and, though she could not recall ever contacting Bourke directly, she found she had been blocked by her. She thinks she might have mentioned Bourke within a wider conversation, but she would never be abusive. I follow her and she is typically very polite. How widely is Bourke blocking if she is barring people who haven’t even contacted her directly? A newspaper, radio or TV journalist can’t stop someone from reading, hearing or seeing their news items. An online journalist can’t stop particular users from commenting on their articles. Twitter gives journalists a unique way to garner feedback, but from Bourke’s reaction, it’s fair to say she does her best to ensure that those who provide feedback are not encouraged to do so again. Engagement is not only discouraged, it is physically blocked. Bourke’s attitude is representative of most mainstream journalists’ perception of social media. They see it as a handy way to get more attention for their work, but they don’t appreciate feedback and will do their best to ignore or block anything they see which they don’t like. I don’t think Bourke really gets social media. It is very telling when the only mainstream journalist in the country who is dedicated to the medium is restricting her audience through blocking, rather than growing it by encouraging more engagement. Bourke is not alone in this epic social media fail. The entire industry is struggling to understand the opportunities of social media, and are doing their best to ignore or block it for as long as they possibly can, to the detriment of their profits. So what do you think Latika Bourke thought of my Tweet requesting information from users she has blocked? I can’t tell you what she thought, because she didn’t respond. But she did block me. Enough said. Spot on. In my dealings with her, she is defensive in the extreme, unable to comprehend why anyone would challenge her opinions/reporting. She even called the people who disagreed with her ‘loonies’ in one thread. Hardly professional unless she is being mentored by Akerman, Bolt or Albrechtsen. My impression is that she is immature with an ego disproportionate to her ability. Not saying she won’t improve over time and with more experience, but to improve you need to be able to reflect on your practice/profession and act on building & enhancing skill rather than ignoring deficits. Congratulations on this piece. It needed attention. Maybe it is the 2UE background that is the problem. Opinions that are not liked are given short shrift and even contempt, in that world, because they can. Latika does not seem to understand that she works for a public broadcaster now and that we have the right to see what she is reporting on and even criticise her if we think she is not fairly presenting the news. It’s part of the 20 cents a day, or whatever it is now, that we pay. But yes, it is also about not understanding twitter and the back and forwards. It is supposed to be interactive not dictatorial. Thanks Vic, I’m so glad someone has brought this up! I wonder how the Job and Person Spec for Latika’s position reads, as surely it required extensive experience in the social media space. I’ve known people to embellish in their job applications, but what about reference checks? Shame on you ABC, this screams of old people trying to ‘get in with the young kids’, a missed opportunity in developing a following on Twitter with a credible communicator. But really, I can’t get past her twitter profile photo, it reinforces my thinking that she is an amateur. I used to follow Latika but I don’t any more. She did unfollow me once for saying that Mark Scott said she’s doing a good job but it was in another conversation that criticized her. After she realized that I was innocent she followed me again. I don’t follow her because she has a propensity to forget to put quotation marks around a quotation. I never know if it’s a personal remark or a quote so I gave up. I like Latika and I’m sure she has great potential. By the way, she has been on ABC TV commenting on political questions and once she hosted The Drum. Seems I haven’t missed much by unfollowing her because people are always retweeting her in my time line. I was blocked several months after she joined the ABC because I suggested there was some bias in her tweeting. A small twitter campaign by my, then, few twitter friends softened her heart and I was reinstated to her good books. I was blocked again several months ago when I was a part of an “Unfollow Latika” campaign. That blocking remains. I claim special status as I have been blocked by her TWICE! Is there any way I can get Andrew Bolt to block my TV from his broadcasts? Think you’d need a Liberal Filter for that. Trouble is, that would block out most of the ABC’s political ‘reporting’ also. About a year ago a tweeter that I follow (can’t remember now who it was) asked the question ‘Does Latika Bourke represent the ABC when she tweets?’. I had unfollowed Latika several months before this question was asked, so I looked her profile up via Twitter ‘search’ to see what her bio said. Sure enough it said she was social media reporter for the ABC based at Parliament House Canberra. So I replied to the tweep that her bio suggested that she tweeted on behalf of the ABC. While looking at her profile I noticed a lot of ranty tweets from her to this particular tweep (which had obviously prompted his question). I wanted to go back to her profile to read the full conversation between the two of them – to get both sides of the story as such. Well, that didn’t work because between me replying to the question and wanting to read the conversation in full, she’d blocked me. I was blocked by Latika back when she was still working for 2UE. I think it was for suggesting she read Grog’s now famous blog post on the election coverage, instead of tweeting about breakfast served on a plane on a tarmac. Or maybe it was for calling out her friend and mentor, Samantha Maiden, for bias. I was rather shocked, as I had been in email contact with Latika (initiated by her), and done a favour for a friend of hers. Not expecting the block to be lifted, because I have been less than complimentary since. As I recall, she was recruited to ABC by Jonathan Green. Perhaps he could explain why he thought it a good idea, and what the terms were. Suggest that if you complain to the ABC, you post copies of their responses to the watchdog site, ABC Gone To Hell. 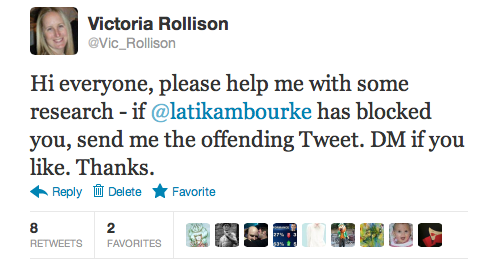 Originally I believe I was blocked for this tweet… “@latikambourke “bungled”? It would have been a bungle, if Rupert had of won it, rather than the ABC of hyperbowl.” It was in relation to the tender for the Australia Network. My beef was the creep into the ABC of the language of a political judgement in reporting. More recently, I became frustrated that I was constantly spotting Latika retweets of news of interest to me, opening them to find I was unable to make sense of the rest of the conversation because I was blocked. I was also rather curious why Latika had decided to follow me in her other QT twitter account. Next from her was ..”you aren’t blocked. AS I am tweeting to you.” My reply “I am blocked on your other account, unfortunately”. Things pretty much ended with this from her..”well you’ve probably been rude and nasty. I don’t have time to read that sort of stuff sorry”. All pretty weird and annoying. Thanks for the opportunity to tell the story. Glad to know I’m not the only one who has been blocked. Latika is the only person who has ever blocked me. No feedback to a legitimate question. She has very thin skin. I got sick of her constantly acting as a stenographer for the LNP, and blocked her. Not only do her tweets contain bias, they contain far too much snark for a journalist. She also comes across as a bit of a fangirl to certain pollies. Not mentioning any names but she choses to display a pic of one on her profile page. I felt I should put forward a dissenting view. From what I’ve seen, there is a considerable group of people on Twitter who can’t tell the difference between someone reporting what a politician said, and editorializing. Simply reporting on something that Tony Abbott said gets some fellow-lefties in a frothing rage, like Latika has endorsed that point by simply reporting on it. She cops the same thing from right-leaning Twitter users as well. Frankly, seeing the abuse she cops on Twitter for simply doing her job, I’d be less patient and block more people than she does. I quite often reply to her tweets but in the frame of making a comment about the politician’s quote, rather than attacking her for reporting on it, and often she responds quite reasonably to me. Also, recently I tweeted to Joe Hockey, attacking him for his claim that under the Liberals, Treasury was never used for political purposes, and linked to a Costello press release where he did just that. It was RTed heavily on #auspol and Latika RTed it herself. If she really was a mouthpiece for the right, why would she do that? I recognise and admit that I have political bias. I think some people see their way of seeing politics as the one true way, and anyone that doesn’t fit in their echo chamber are the ones with the bias problem. I think the question people should ask themselves is, if you were given the same position Latika has, how effective do you think you would be at putting aside your own biases? I suspect many of us would struggle. 1. she prepared for the 2010 election campaign by watching The West Wing (and tweeting it ad nauseum), as though that was all the background knowledge she needed. So my complaint about Latika’s work has nothing to do with the parrotting of Tony Abbott’s brainfarts, though it strikes me as an unnecessary and trivial thing to do. But everything to do with the shallowness, pettiness, and ignorance she displays in her work. When I first encountered her, I was prepared to make excuses: she was young, she worked for a crap radio station. But those days are long gone, and I think her standing far excedes her ability. I blocked HER months ago…got so sick of her blatant bias toward LNP – Abbott especially – ABC journalists are “supposed” to be fair and UNopinionated. Not Bourke. She breaks all the rules of the ABC charter for journalists to be fair and balanced and not express an opinion. It is so obvious she is so pro Abbott – but then the majority of the ABC journo’s are falling into this trap. I guess with Mark Scott being at the helm and being a former LIB staffer both State (NSW) and Federal – what can we expect? I am disgusted at the turn the ABC has made away from fair and balanced journalism. Even Steve Cannane bought into this on Twitter the other day. He defended the choice of constantly having on former Lib MP’s who never provide balanced opinion – its just a forum for them to attack attack attack the ALP – and the ABC willingly gives it to them and NEVER picks them up on it. As a left wing political commentator I offered my services to the Drum to bring in a bit of balance – never heard back. Bet if I had of said I was a right wing political commentator they would have rolled out the red carpet. True. But to be fair there are lots of other journos and non-journalists out there with a similar attitude as this. Especially activists – eg @mssunili , who once said something very offensive and inflammatory and blocked me when I pulled her up on it. Hi I was blocked by Latika Bourke and am not sure why. I don’t remember writing anything to her specifically. I do tweet my opinions on Abbott and the Coalition sometimes. How do I find the offending tweet if there is one? Her Twitter following is a fad. It has no substance and no real benefit to anyone. It will diminish. Lets face it, she’s a moron. She wouldn’t know a policy if it bit her, she’s a typical glammed up member of the press gallery- basically a professional gossip columnist. Pathetic. Sure, it’s reasonable to take a look at the quality of her output (keeping in mind, you don’t have to follow her) But I think blocking is just a way of managing your presence on Twitter. There are so many vicious trolls on Twitter. I personally block strangers that attack me straight away, they are usually Liberal party staffers or Young LIbs. There is no value in getting into personal arguments. I know people with only a few 1000 followers who say it is very hard to keep up with all the replies. The more you tweet the more people respond. It doesn’t add value for the median follower for her to take up every single debate. Next, perceived bias doesn’t really matter. We don’t complain that our fav journo’s have a left bias. If you have half a brain you should be able to take in news and opinion from multiple sources and come to your own conclusions. P.S I think this blog’s campaign has been successful because she has not tweeted for an entire month.